Williams Accumulation Distribution is traded on divergences. When price makes a new high and the indicator fails to exceed its previous high, distribution is taking place. When price makes a new low and the WAD fails to make a new low, accumulation is occurring. 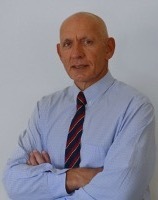 Williams Accumulation Distribution was created by Larry Williams. Go long when there is a bullish divergence between Williams Accumulation Distribution and price. 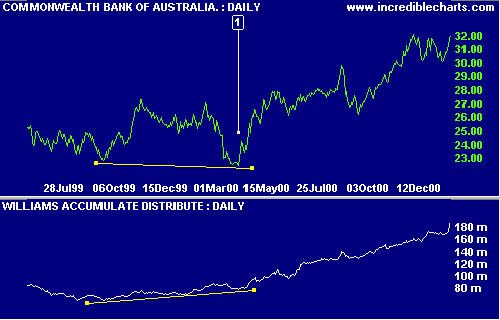 Commonwealth Bank of Australia (CBA) is plotted with Williams Accumulation Distribution. Go long [L] on a bullish divergence. Steven Achelis omits step 3. above in his book Technical Analysis A-Z and several other websites/software programs appear to follow this approach. For the benefit of investors accustomed to Achelis' approach, we have provided both versions. Achelis' version is described as Williams Accumulate Distribute.